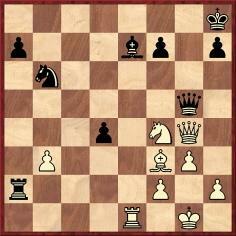 22...Qf5 23 Qe2 Nxf2 24 Qxf2 Bxe5 25 dxe5 Qxe5 26 Qd2 Qe4 27 g3 Re6 28 Qd4 Rfe8 29 Kf2 Qf5 30 Qxa7 R8e7 31 a4 g5 32 Qc5 Qh3 33 Kg1 gxf4 34 Rc2 Rxe3 35 Rf1 Re2 36 Rxe2 Rxe2 37 White resigns. 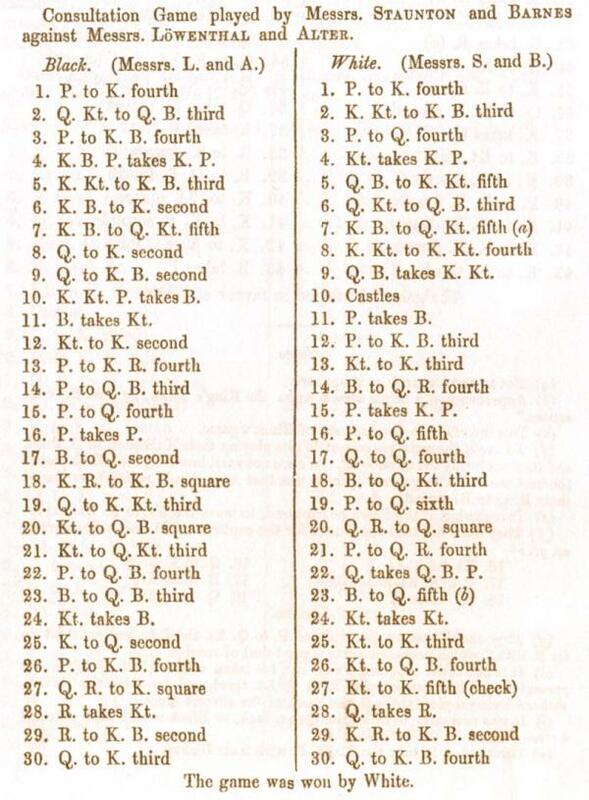 Other examples of displacement chess are on pages 88-90 of The Encyclopedia of Chess Variants by D.B. Pritchard (Godalming, 1994). 1 d4 d5 2 c4 dxc4 3 e3 e5 4 Bxc4 exd4 5 exd4 Nf6 6 Qb3 Qxd4 7 Bxf7+ Kd8 8 Be3 Qb4+ 9 Nc3 Qxb3 10 Bxb3 Bd6 11 O-O-O Ke7 12 Bg5 c6 13 Nf3 Rd8 14 Ne4 h6 15 Rhe1 Kf8 16 Nxf6 Bf4+ 17 Bxf4 Resigns. 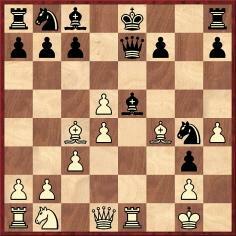 1 e4 e5 2 f4 Nc6 3 Nf3 d6 4 Bc4 Be6 5 Bxe6 fxe6 6 fxe5 dxe5 7 d3 Nf6 8 O-O Bc5+ 9 Kh1 O-O 10 Nc3 Ng4 11 Qe2 Nd4 12 Nxd4 Rxf1+ 13 Qxf1 Bxd4 14 g3 Qe8 15 Nd1 Qh5 16 h4 Rf8 17 Qe1 Nf2+ 18 Nxf2 Qf3+ 19 Kh2 Bxf2 20 White resigns. 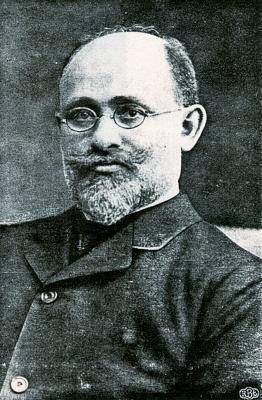 Wolsza’s book records that Chaim Janowski died in 1935, his year of birth being unknown. 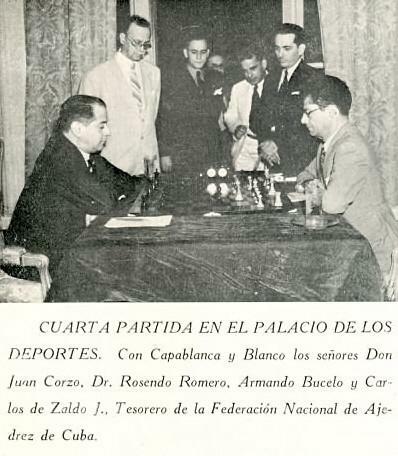 On page 16 of the January 1956 Chess Review Ossip Bernstein described him as ‘a wealthy merchant in Łódź’. C.N. 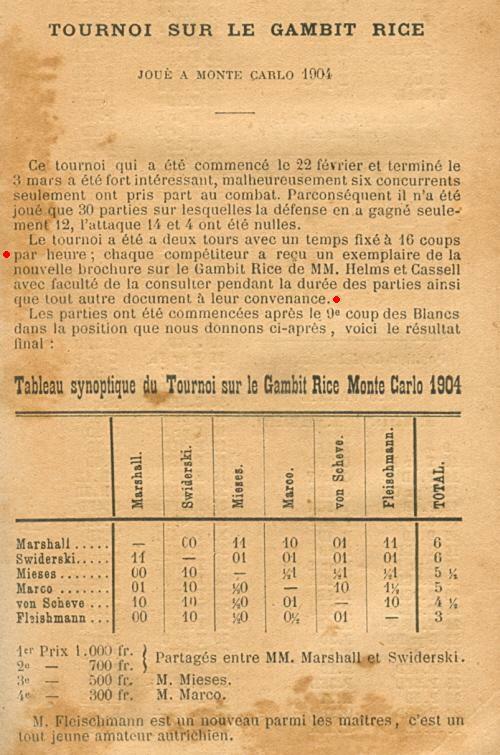 1979 (see page 214 of Kings, Commoners and Knaves) mentioned a report on page 65 of La Stratégie, March 1904 that in a Rice Gambit tournament at Monte Carlo that year the competitors received The Rice Gambit by H. Helms and H. Cassel (New York, 1904) and were allowed, during play, to consult it, as well as any other documentation. 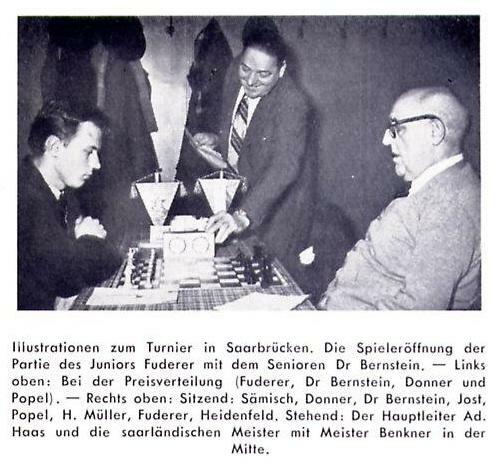 In short, Marshall protested that Swiderski had gone beyond the rules, which merely allowed the booklet The Rice Gambit to be consulted, and not other documentation (such as rough cuts of material due to be published in the Wiener Schachzeitung). Here Marshall played 16...f4 and eventually lost. Information about the relevant writings of Perrin would be welcomed. As regards the reference to Réti, see Breyer and the Last Throes. This difficult exercise will need to be taken gradually. 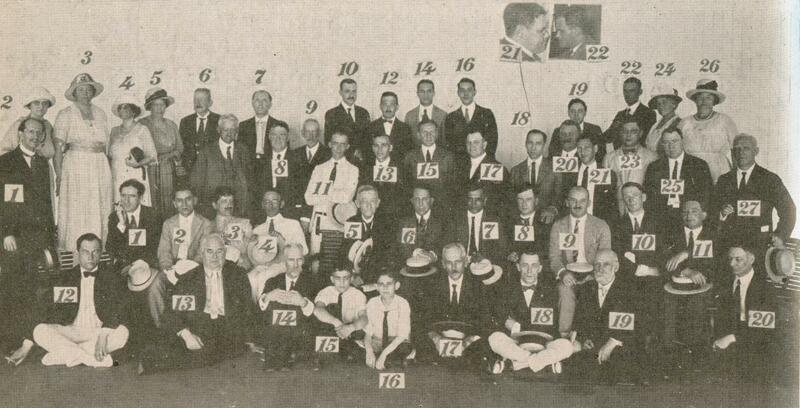 In the photograph Leonard Barden (London) identifies: B. Rabar (standing in the front on the left, with dark glasses); A. Matanović (seated on Rabar’s left); A. Fuderer (seated two places to Matanović’s left); B. Milić (second man from the right standing at the back); V. Pirc (seventh man from the right standing at the back). 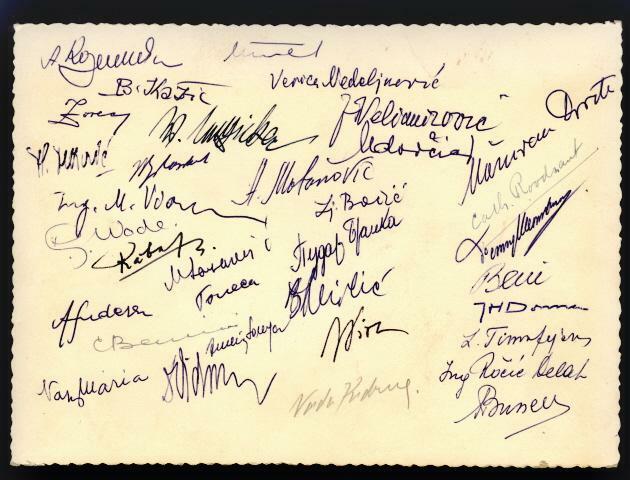 What correlation is there between the photograph and the signatures? 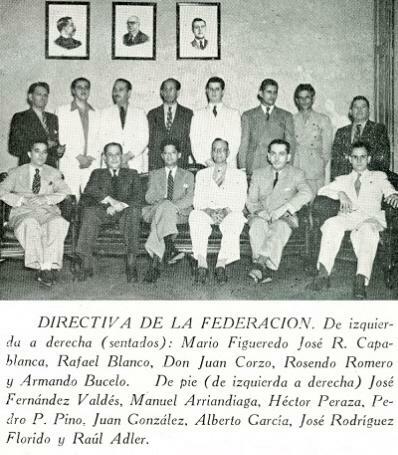 The latter include B. Kažić, W. Unzicker, H. Golombek, M. Vidmar Jr., R. Wade, A. Fuderer, M. Vidmar, A. Matanović, C. Roodzant, A. Beni and J.H. Donner. 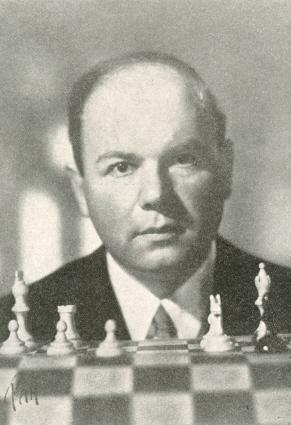 This photograph is of Harald Malmgren and was the frontispiece of his book Mina Bästa Partier (Örebro, 1953). 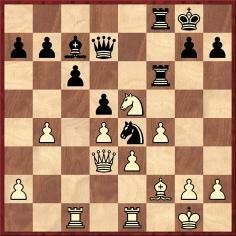 7...Nxd4 8 Nge2 Qxb2 9 Rb1 Resigns. 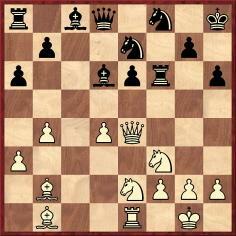 In a database we have seen Black’s seventh move mistranscribed as ...Nxd5. 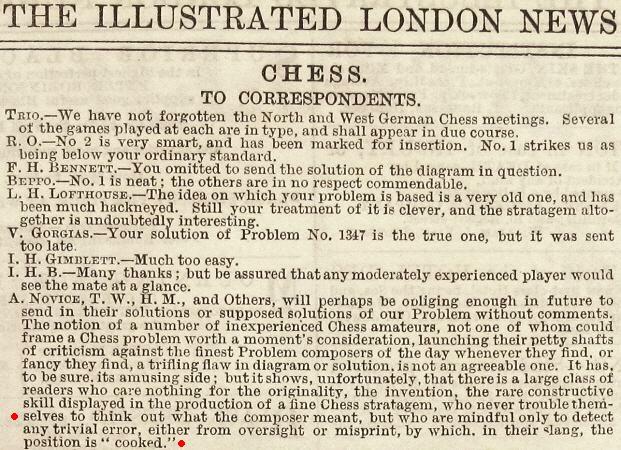 The three-way tie for first place was confirmed on page 114 of the 15 May 1886 issue of the Chronicle, as well as page 111 of the May 1886 International Chess Magazine (and pages 210-211 of the May 1886 BCM). 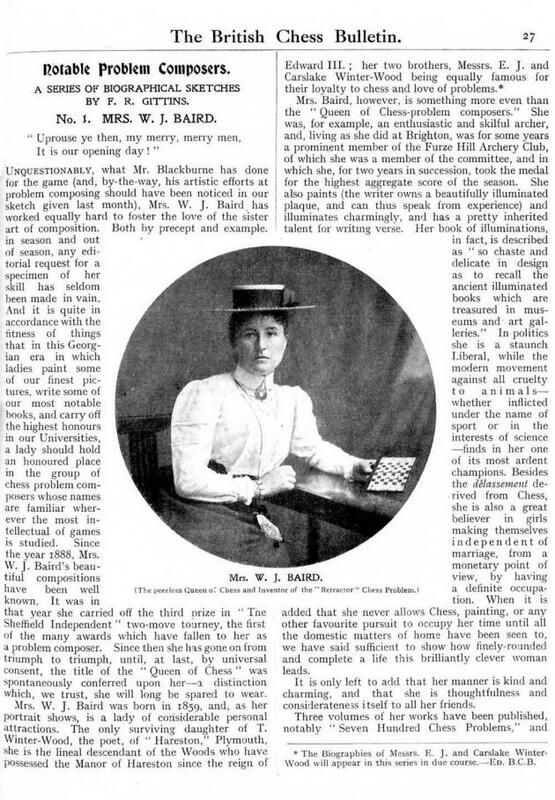 The Chronicle gave a few of the games, including the following one on page 138 of the 15 June 1886 issue. 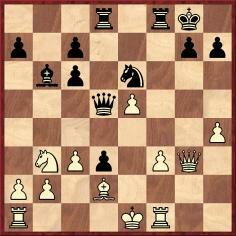 21 d5 exd5 22 Qh4 Neg6 23 Qh5 Nf4 24 Nxf4 Bxf4 25 g3 Bc7 26 Re8 Qd6 27 Ne5 Kg8 28 Ng6 Rf7 29 Qh4 Qb6 30 Ne7+ Kh8 31 Bd4 Qd6 32 Bc5 Qd7 33 Qxh6+ gxh6 34 Bd4+ Resigns. 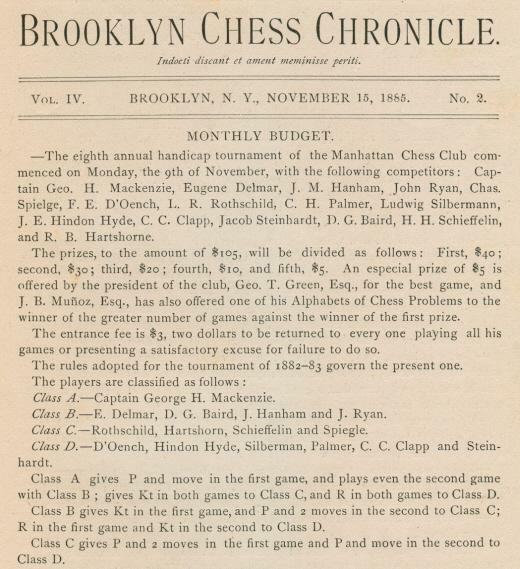 Page 129 of the same edition of the Chronicle reported regarding this victory that ‘Captain Mackenzie received the prize of $5 for the most brilliant game’. 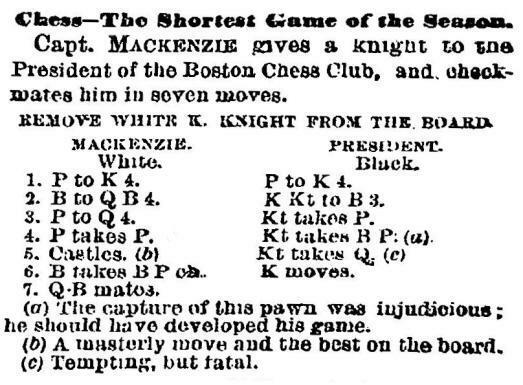 Four other games by Mackenzie (against Delmar and Ryan) were annotated by Steinitz in the International Chess Magazine in 1886. C.N. 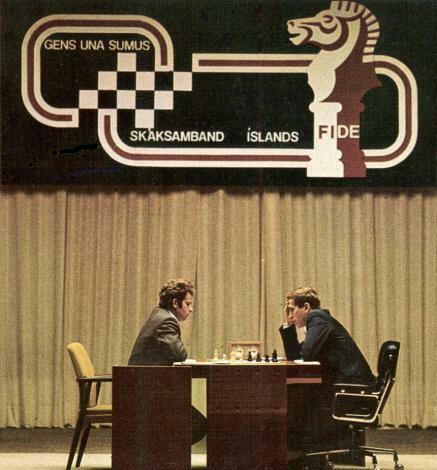 2816 (see page 71 of Chess Facts and Fables) sought ‘lesser-known instances of masters making unfavourable scores in simultaneous displays’. As regards a well-known case (+0 –20 =10 by R.G. 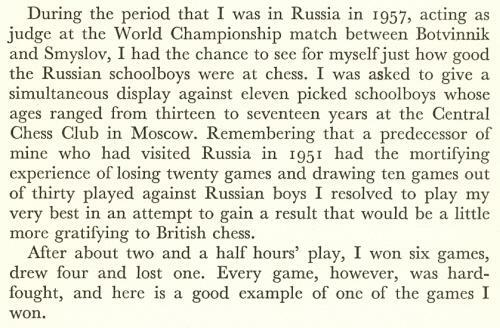 Wade in Moscow, 1951), we should like to know whether the Soviet press of the time published any of the games. 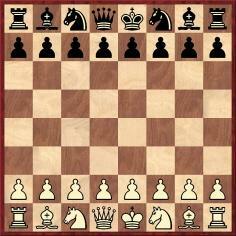 30 Qh3 Rb2 31 Be4 h6 32 Ra1 a5 33 Rxa5 Qf6 34 Rf5 Qg7 35 Nh5 Qg6 36 Re5 Qd6 37 Qf5 Resigns. 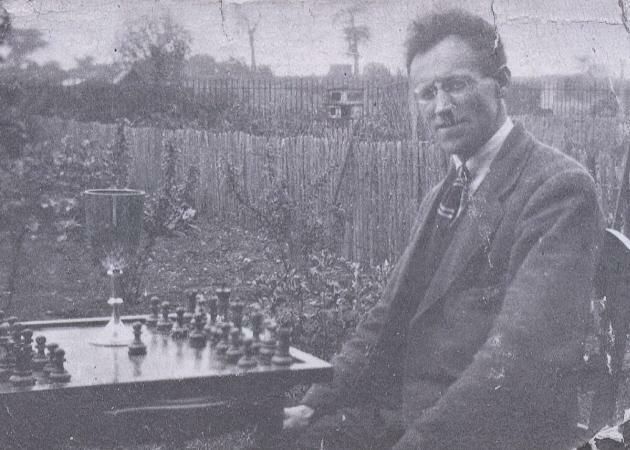 Daniel King (London) asks for information on the old story about Alekhine playing two games, with alternate colours, against a pair of amateurs who hatched a scheme whereby the master’s moves in the first game were repeated against him in the second one, the aim being to ensure that he could not win both games. ‘Standing from left to right are: J. Nikolac, B. Rabar and B. Kažić. 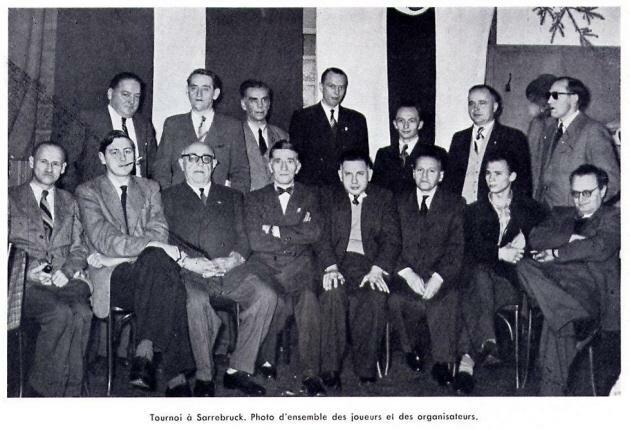 In front of them, seated, are M. Bertok, A. Fuderer and B. Kićović. 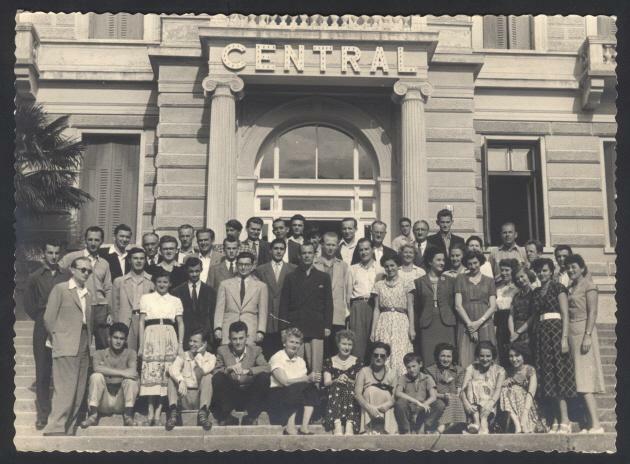 Seated third from the right is J. Velimirović (with her young son Dragoljub), and behind her is V. Nedeljković. Standing behind her in the back row and in the dark jacket is D. Kićović. 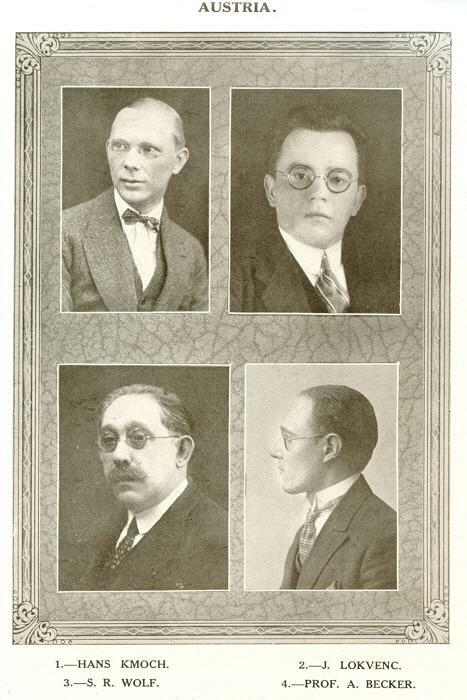 Third on Kićović’s left is B. Milić, and third on his right is Pirc. Four places to the right of Pirc is I. Buljovčić. I received this information from Dragan Kićović. Moreover, Vojin Vujošević has informed me that the woman standing third from the right, with her hands clasped in front of her is Tilka Vuković (later Tilka Miličić). We are also grateful to Alan McGowan (Waterloo, Canada), who identified the occasion as Opatija, 1953. 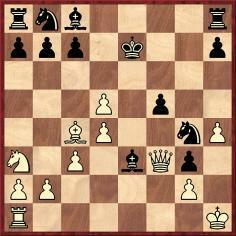 21...a5 22 c4 Qxc4 23 Bc3 Bd4 24 Nxd4 Nxd4 25 Kd2 Ne6 26 f4 Nc5 27 Rae1 Ne4+ 28 Rxe4 Qxe4 29 Rf2 Rf7 30 Qe3 Qf5 0-1. Our correspondent also mentions a database where 21...a6, and not ...a5, is given. Löwenthal’s partner (‘Alter’) was John Owen. 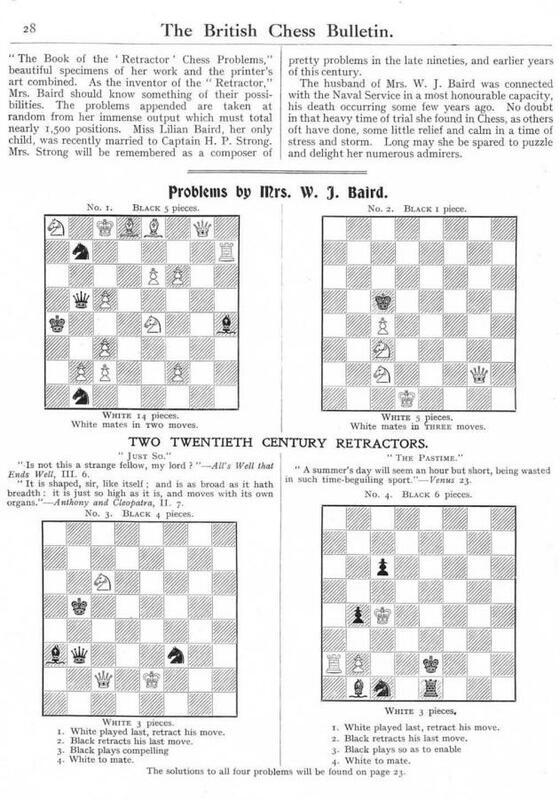 ‘After Staunton and Barnes’ 30...Qf5, Staunton stated in the Illustrated London News that “The remaining moves were not recorded, but the game was won by White”. It should be borne in mind that Staunton and Barnes had the white pieces. 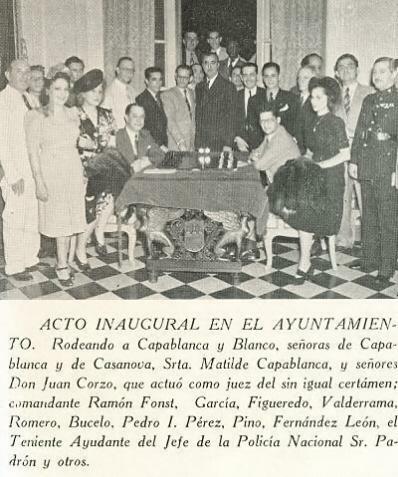 Further to our article Mysteries at Sabadell, 1945, Andrés Vicente Sanz (Valencia, Spain) sends us two newspaper cuttings which provide some additional information and complications. 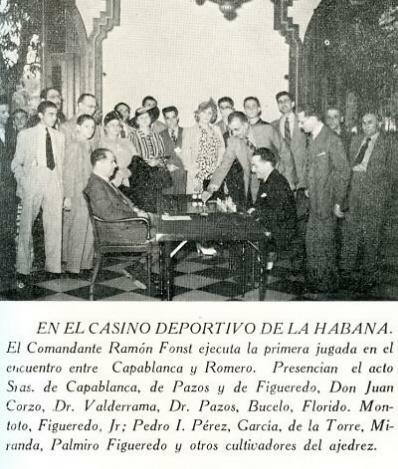 The above report on page 2 of El Mundo Deportivo, 3 August 1945 gives the results of the first round, played the previous day, and lists, in the final paragraph, the remaining tournament schedule: daily rounds at various venues in Sabadell from 3 to 10 August, with play in the morning on 5 August. 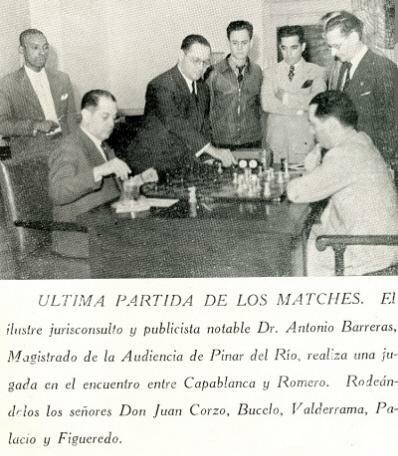 This presents not only the results of round two in Sabadell but also a report on a simultaneous exhibition by Alekhine (+17 –4 =9) in Saragossa, the same day (3 August). 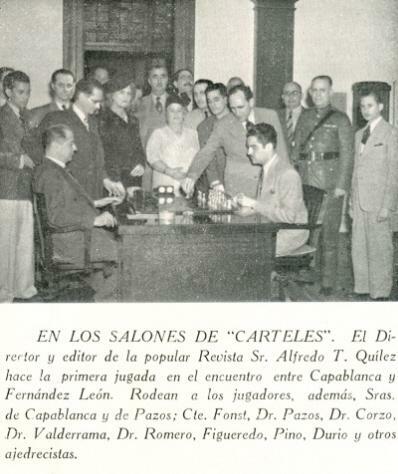 The display took place from 18.00 to 22.30, and our correspondent wonders how Alekhine could have played a tournament game in Sabadell in the afternoon and, starting in the early evening, an exhibition about 250 kilometres away (accompanied in Saragossa by F. Lupi). 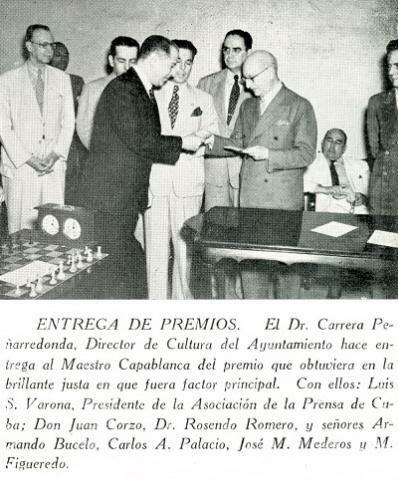 ‘Some years ago I gave a lecture to the British Chess Problem Society about E.E. Westbury, an excellent composer whose work deserves to be better known. 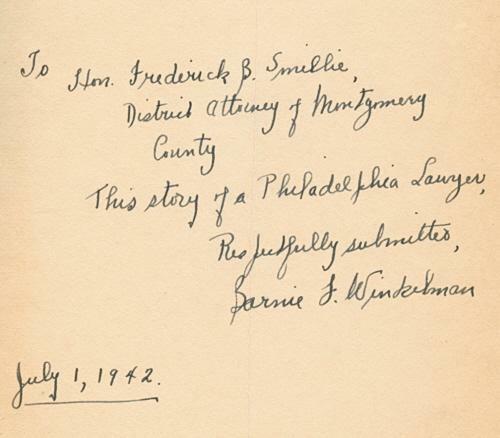 The text was reproduced in The Problemist and later added to the BCPS website. 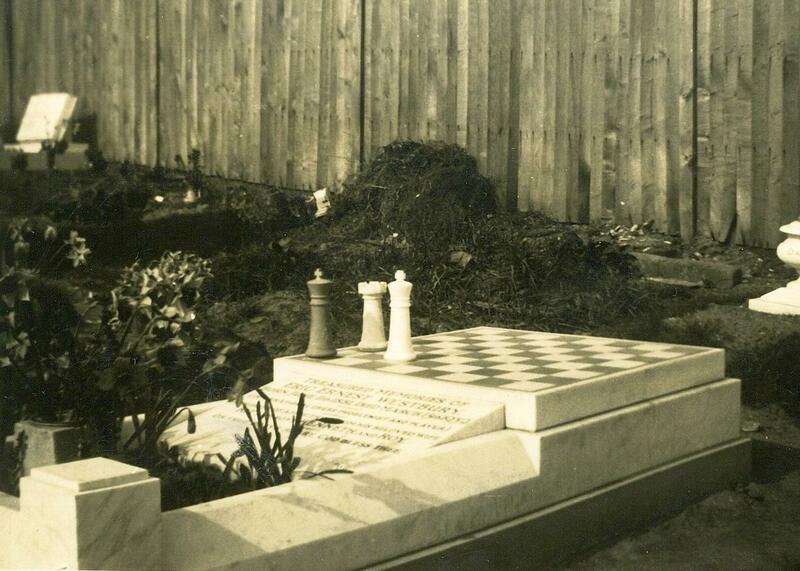 Mr McDowell has also forwarded to us, courtesy of Ian Westbury, a photograph dated July 1924. 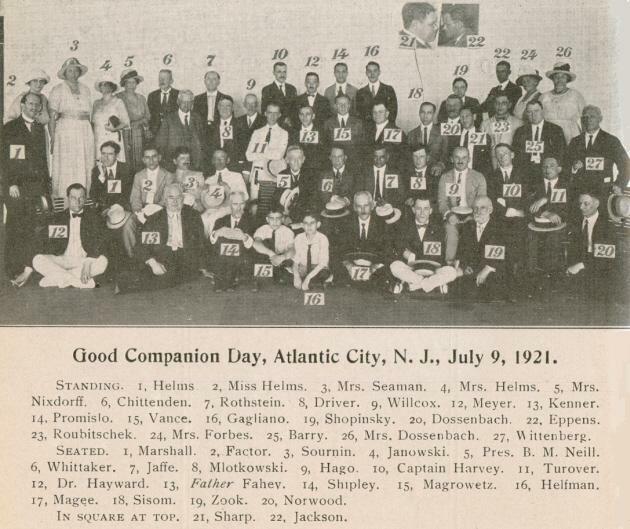 Can any information be traced about the occasion (e.g. based on the trophy)? C.N. 5391 asked for information about F.R. 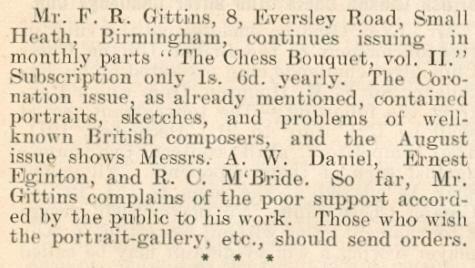 Gittins, the author of The Chess Bouquet (London, 1897). The price was three shillings and the address was the one given in C.N. 5391 (8 Eversley Road, Small Heath, Birmingham). 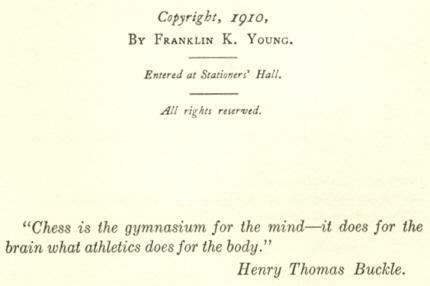 These two works were mentioned again in the September 1910 Chess Amateur, page 356, and the latter book was included in Frank Hollings’ advertisement opposite that page. 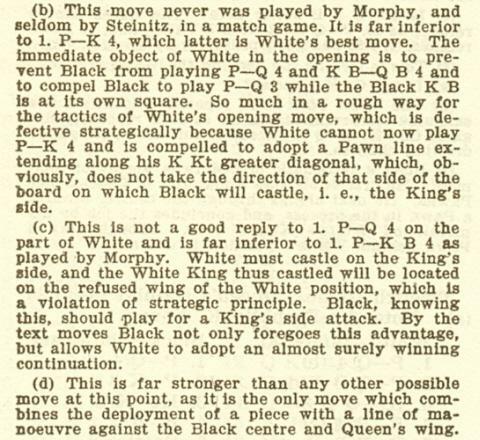 Page 17 of the December 1910 British Chess Bulletin (see C.N. 6307) announced the first of a series of biographical sketches entitled “Notable Problem Composers” by F.R. 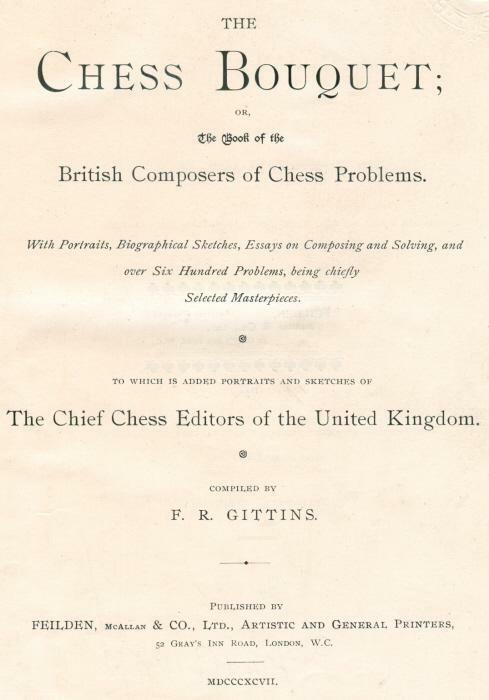 Gittins, and it was stated that each article would include a photograph of the composer dealt with, these being taken from Gittins’ new book One Hundred British Chess Players. This seems to indicate some confusion over the two works. The first biographical sketch, on pages 27-28 of the December 1910 Bulletin, was of Mrs W.J. 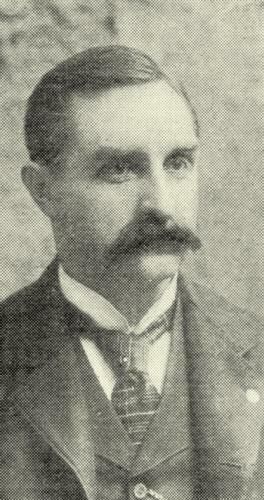 Baird, and the second, on pages 37-38 of the January 1911 issue, dealt with Carslake Winter-Wood. No further articles appeared. 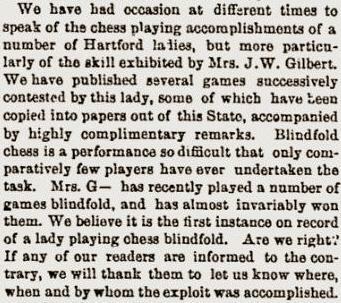 Gittins also compiled an article on pages 15-16 of the November 1910 British Chess Bulletin entitled “The Jubilee of Mr J.H. Blackburne” and celebrating his 50 years of chess play. 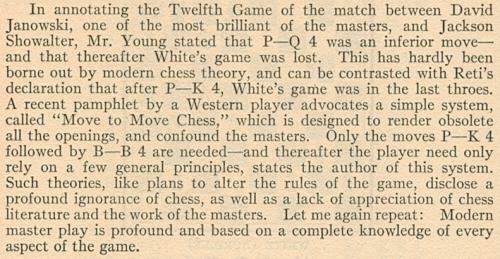 Page 485 of the January 1912 Chess Amateur stated that it had received from Gittins No. 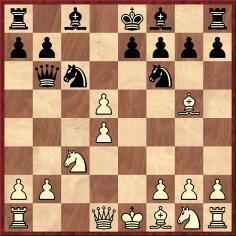 3 of his Chess Bouquet, containing “12 problems by W.J. Wood, with his biography, and an article on J.H. Blackburne”. Information is also sought on the above-mentioned novel Life on nothing per week. 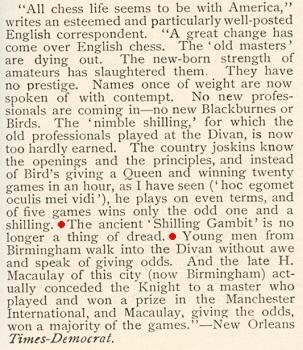 We add that on page 55 of the November 1907 Chess Amateur Philip H. Williams launched a testimonial fund for Gittins, who ‘has been out of employment for a distressingly long time’. Many leading problemists answered the call. 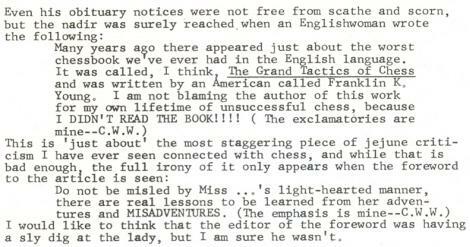 Williams wrote that The Chess Bouquet was a ‘splendid book’ and ‘quite unique amongst problem literature’. 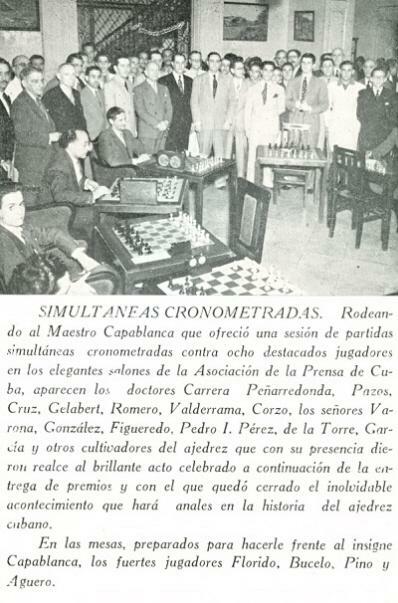 He also remarked that it ‘will always remain one of the most imposing works on chess problems’. 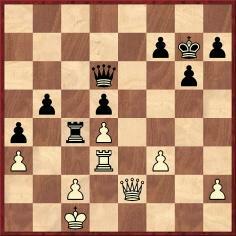 Who introduced the term ‘poisoned pawn’? 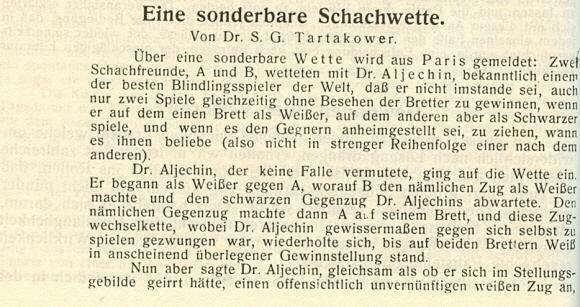 It appears on page 255 of the second volume of Alekhine’s Best Games (in a note to White’s 15th move in Alekhine’s second match-game against Euwe in 1926), but the earlier German and French texts (in Auf dem Wege zur Weltmeisterschaft and Deux cents parties d’échecs) did not include the notion of poison but merely referred to danger. 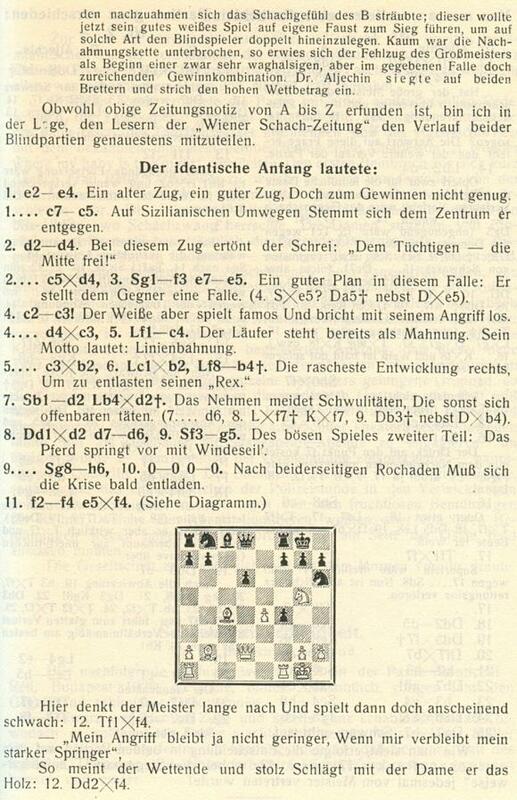 The above comes from page 186 of Chess Curiosities by Tim Krabbé (London, 1985), and Claus van de Vlierd (Oldenburg, Germany) asks whether the full game-score is available. 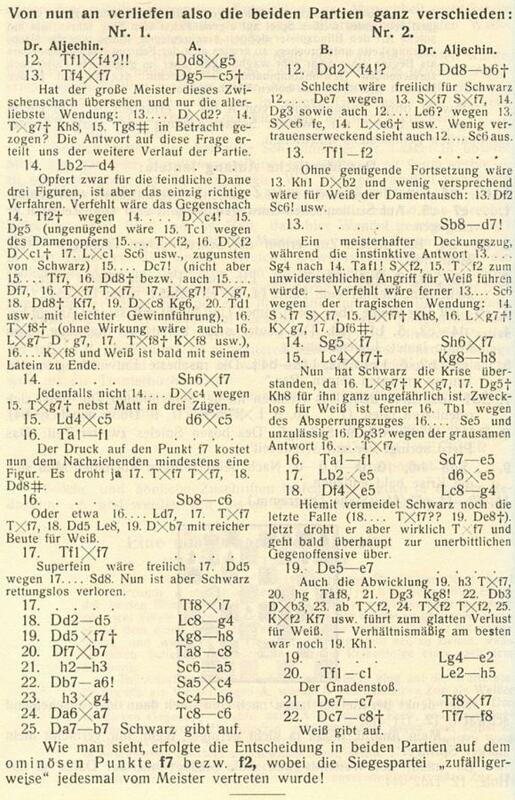 See also pages 916-917 of the October 1996 issue of EG, which states that the score only as far as move 42 was given in the 1/1984 issue of Shakhmatny byulleten. Serin Marshall (Brooklyn, NY, USA) asks whether any recordings have survived of Shelby Lyman’s television programmes on the 1972 world championship match. This was followed by a ‘once’ anecdote. 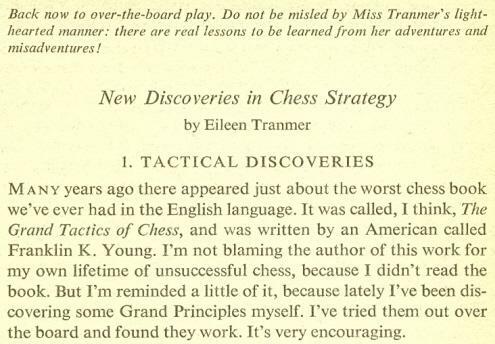 The entire little item had another outing on page 317 of the August 1915 Chess Amateur. Rod Edwards (Victoria, BC, Canada) draws our attention to his website Edo Historical Chess Ratings. 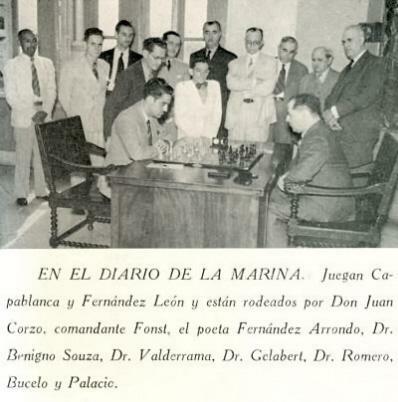 Leonard Barden (London) informs us that in the second photograph the seated figure identified by FIDE Revue as S. Popel is A. Dunkelblum, and that Popel is standing third from the left.